On Oct. 23, 1941, Walt Disney released his fifth animated film. It tells the story of Dumbo, a baby circus elephant with big ears. Because of this flaw, he received remorse from the circus, became separated from his mother and turned into a clown. With the help of his friends in his journey, he discovers his ears give him flight. By the end, Dumbo becomes an overnight sensation, headlining the circus, and reunites with his mother. “Dumbo” is a heartwarming tale about self identity. Though Dumbo felt discouraged, he found his true potential. It is charming in humor and drama for audiences of all ages. Aside from the feel-good story, the film features some of the most beloved songs that define the magic of Disney. This March, Dumbo soared back into theaters. The imagination of Tim Burton offers a fresh perspective on the beloved tale. The story is about the Medici Family Circus in the 1920s, whose traveling circus experiences hard times. Holt Farrier, the circus’ trick rider, played by Colin Farrell, returns from fighting in Europe, but he’s lost his way in life. He struggles to adapt to change and reconnect with his kids. The circus is also expecting a new baby elephant. When Dumbo arrives, he is considered an outcast for his big ears. The ringleader Max, played by Danny DeVito, tries to not make this an embarrassment, but Holt’s kids discover this baby has a talent. 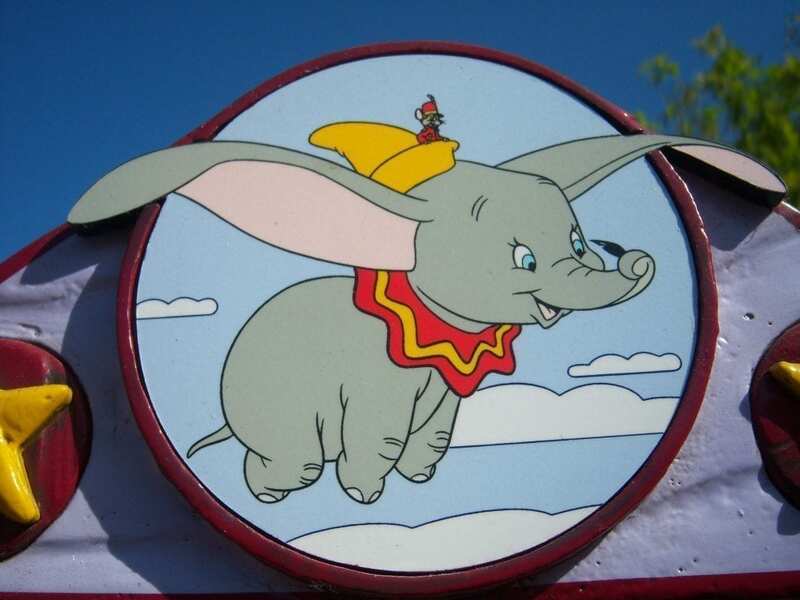 With the aid of a feather, Dumbo can use his ears to fly. Suddenly, Dumbo becomes the talk of the town, attracting a big shot circus promoter V.A. Vandemere, played by Michael Keaton. Vandemere thinks he can take this family circus to the top, but problems ensue when he separates Dumbo from his mother. It’s up to Holt and his kids to help Dumbo reunite with his mother. Burton brings his imagination to life through both his original stories and applying it to classics. Tainted with Burton’s dark elements, the story feels less family-friendly and more suspenseful for younger audiences. The original film contains a sad plotline surrounded by a positive atmosphere and lovable characters. Burton did the opposite. Even the CGI of Dumbo was haunting. The overuse of action and suspense makes this film lose its kid-friendly appeal. It might give children nightmares. Of course, the film made references to the original story, including renditions of the song “Baby Mine.” Unfortunately, the revival featured the band “Arcade Fire” and gave it an unnecessary upbeat tune, butchering the song’s message and tone. While the original story focused on Dumbo learning to fly in the end, he learns about it at the beginning of the remake. From that point on, he is portrayed as a supporting character while the human characters figure out their problems. This also leaves a lot of room for a basic antagonist. The ringmaster was very basic in action, thinking of only money, power and expressing cruelty to others. The supporting cast had more backbone to the film than the lead actors. Although Farrell played a father who reconnects with his children, he mostly mopes around trying to return to normalcy. Fortunately, DeVito portrayed a well-rounded character who treated his circus as a family, while also trying to keep them from losing everything. Perhaps the best character was Eva Green, who played Collette, a trapeze artist. She appeared intimidating at first, but when she interacts with Holt’s family, she shows kindness and understanding. She was one of the few actors who carried audiences through the show. In recent years, Disney’s revivals include a dark touch to their beloved stories. Sometimes, though, that dark touch can ruin the experience of watching the original. Burton’s adaptation of “Dumbo” turned the story into a kid’s house of horrors. From the various settings and the computer animation, Burton and his team transformed “Dumbo” into a creepy mess. The casting selection varied in performance. Overall, audiences will be entertained with the story, but younger members should stick with the 1941 animated film. “Dumbo” earns a rating of 7 out of 10.